As per the variegated requirements of our clients, we are offering a pure grade of Goda Masala to our clients. Our provided masala is processed at our processing unit utilizing high grade spices with the aid of ultra modern machinery and tools. Furthermore, the offered masala is used in a little quantity at the end of cooking or fried in the beginning of cooking to add a delicate flavor to the cooked dish. 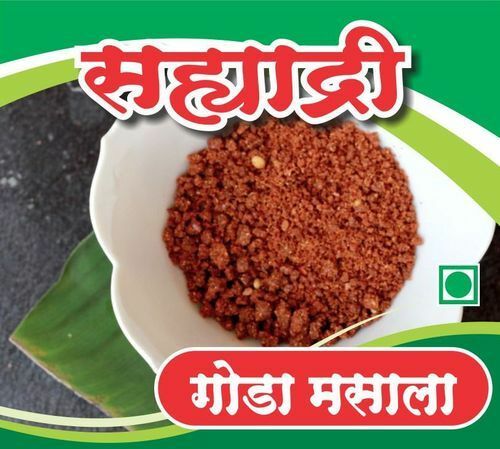 Our prestigious clients can avail this masala from us at market-leading prices. Incorporated in Pune (Maharashtra, India), in 2013, we “Shramika Enterprises”, are the prominent Manufacturer, Trader and Supplier of a qualitative range of Red Chilli Powder, Coriander Powder, Garam Masala, Black Pepper Powder, Sambar Masala, Turmeric Powder, Kolhapuri Masala, Pulav Masala, Jeera Powder, Dabeli Masala, Jaljira Powder, Tea Masala, etc. We firmly believe in combining the proven age-old traditional practices of spices production ensuring consistent flavor and aroma with modern techniques. Our foray in spice manufacturing was inspired by practical hands-on experiences while dealing with available options and their limitations along with the guidance of culinary stalwarts representing different generations. Processed using the finest quality ingredients and latest technology, our entire product array is cleaned and finely packed under hygienic conditions. These products are appreciated for their attributes like purity, unadulterated, enhanced shelf life, mouth watering taste, pleasing aroma and exceptional quality. Under the able guidance of our mentors, Mr. Gorakhnath Nangare and Mr. Shivdatta Nangare, we have been able to achieve the topmost position in the industry. Their strict adherence towards quality motivates us to process the best quality range of products.